This is a fascinating article written by Dietrich D. Brakemeier, Chief Design Engineer, Acoustical Systems that I wanted to share. Acoustical System offers, what I believe, to be the finest alignment protractor available - it's what we use here to align every cartridge. From 1938 to 2010 - nothing changed in more than 70 years? In the years around the start of the Second World War, gifted engineers with strong backgrounds in mathematics published in quick succession their groundbreaking calculations for best approaching a theoretical tangential zero tracking error with a pivoted tonearm. These calculations became the industry standard for the years to come – though as Iʼll explain later, theyʼre not the benchmark we should be using today. Erik G. Loefgren and H.G. Baerwald published, in 1938 and 1941 respectively, the definitive calculations based on B. Olneyʼs initial essay in Electronics, November 1937. Loefgren first published his calculations and comment – originally written in the German language – in the „Akustische Nachrichten“ in Ausgabe 3, November 1938. Entitled "Ueber die nichtlineare Verzerrung bei der Wiedergabe von Schallplatten infolge Winkelabweichungen des Abtastorgans“. In English: "About the non-linear distortion in phono record playback as a result of the offset angle of the tracking device“. They came to the very same best possible approximation of a circle segment to a given straight line. Their Euclidean calculations resulted in a tangential curve, which set the standard as being the theoretical and practical best geometric compromise. A compromise for lowest average and total distortion as a result of derivation in the stylus to the tangential horizontal zero. 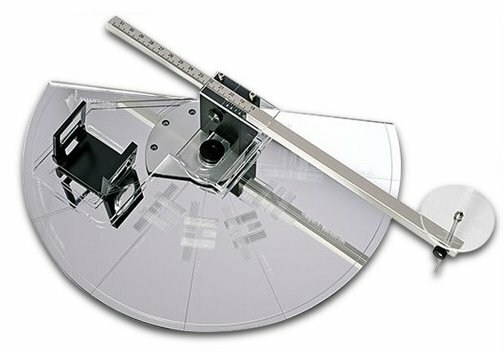 Phono tonearm overhang and offset angle were established as essential features in order for a pivoted tonearm to reach the best possible geometry, thus giving the lowest derivation from the tangential ideal for that 70 to 95 mm of the grooved radius in a 12-inch record. The final result was the best mathematical compromise of the lowest maximum and lowest average distortion in the tracking due to tangential derivation - or tracking error. The analytics of B.B. Bauer in 1945 and John Seagrave in the mid-1950s reconfirmed Loefgrenʼs and Baerwaldʼs theory and results, firmly establishing the tangential curve they calculated as the best compromise in geometric phono tonearm set-up. The tangential curve of 1938/1941 – today named Baerwald DIN or Loefgren A DIN – was the indispensable foundation of high fidelity sound in phono records. The tangential curve calculated by these (unintentional...) pioneers of high fidelity analog sound was mathematically as close to perfect as possible, and their contribution to the quality of phonograph reproduction canʼt be valued too highly. However, the record groove Loefgren and Baerwald did their calculation for was not the record groove we (at least, most of us) play today – far from it. Aside from the mere outer dimensions of the medium (diameter), there are hardly any similarities in the two grooves. Back in their day, the state of the art was the 78 rpm shellac mono record of the 1930s. The groove of a shellac mono record is quite different in most every way from a stereo microgroove record dating 1958 or later. The modern stereo microgroove is considerably smaller. Further, it is engraved with a much finer and more complex three-dimensional encoding. It runs with less speed, resulting in further reduction of available space for a given amount of recorded time. Likewise, the stylus and polished area are magnitudes smaller and more refined today compared to the days of Loefgren and Baerwald. So the stereo microgroove record is not the medium Loefgren and Baerwald faced in the late 1930s, and the modern 12-inch microgroove long-playing (“LP”) record is certainly not the medium they did their calculations for. The stereo microgroove is so different in most every way that it requires a closer look and a different approach to reach a possible optimum in sound decoding when tracking it. Back in the mid-1980s, I started to pay really careful attention to the best possible alignment of my tonearm and cartridge combinations. My efforts soon allowed me to constantly impress visitors listening to my set-up, who were struck by the lack of distortion and, to their ears, extremely precise recreation of the soundstage in the sonic picture. I had been using the original Dennesen Soundtractor since 1984: a solid metal device that allowed for Baerwald IEC alignment independent of the mounting distance. Most, if not all, better tonearm alignment tools available today are based on this ingenious design, which was years ahead of its time. By the mid-1980s I became an obsessed collector of original early pressings of great stereo recordings of the early stereo era. Within a few years, hundreds and thousands of RCA Living Stereo LSC, Mercury Living Presence SR, EMI ASD, DECCA SXL, Columbia SAX, Impulse AS, Blue Note, Columbia 6-eye CS, etc. filled my shelves and rotated on my turntables. Many of these recordings have long grooves – cut fairly close to the paper label and thus often exceeding the “official” limits of both DIN (inner groove limit record radius 57.5 mm) as well as IEC (60 mm, measured from center of the record spindle hole). This fact inevitably means fairly high tangential derivation in the last minutes of many records – in other words, high distortion figures in those underweighted areas of the music where you need/want it the least. Why in those areas? Say you have a 33 1/3 microgroove on your turntable. An LP that is spinning with a constant speed of 33 1/3 rpm. The beginning of the groove, at about the 145 mm point of the LP radius, features about 100 cm groove-space for just short of 1 and 3/4 of a second (1.44 seconds) of recorded signal. That means lots of space and the best conditions for the stylus because it is fairly easy going. Imagine a straight new three-lane highway, early on a Sunday morning in mid-summer, and you get the picture. Close towards the inner label – say at the IEC limit 60 mm radius – the available space for those just mentioned 1.44 seconds of engraved signal is only about 33 cm, squeezing the information into one-third the space we had at the beginning of the groove. And this now with an increased curvature and at a point where the tangential error of the tangential curve of Baerwald and Loefgren is in a steep rise. For the stylus of your cartridge, this is no longer the Sunday morning three-lane highway it tracked 20 minutes ago. That highway has turned into a narrow serpentine in the Chilean Andes – a nightmare of a road that it now has to drive with maximum speed, even while the edge of its chassis (.. stylus ...) is hemmed in. What is happening in these last minutes where the conditions for the stylus get increasingly rough and tight? In classical music – as well as in jazz and rock/pop –the final beats and the closing big climaxes occur exactly while the stylus is approaching the end of the groove. In other words, the majority of the biggest challenges for the cartridge happen just when the periphery conditions are the worst. But this is just one of many facts that call for a slightly different look at the stereo microgroove. Since the mid-1980s, record manufacturing has more and more abandoned record-cutting exceeding a 62 mm radius, an evolution that actually began with lots of customers rejecting records because of inner groove distortion back in the early 1960s and that finally reached the direct metal-mastering era in 1984. The “modern” variation of Baerwaldʼs and Loefgrenʼs calculation (called Loefgren B IEC) – putting the two points of zero tangential error on the tangential curve (”null points”) closer together and the second null point farther away from the center – was tailored to this new trend in record cutting. Superficially, this appeared to be a smart reaction to an altered condition. However, it remained an incomplete solution – only a fairly one-dimensional (over-) reaction to the generally decreased actual cutting radius rather than addressing the complexities of the situation. While I was taking a serious look into the design of phono alignment in early 2010, the before-mentioned problem of the standard tangential curves not sufficiently addressing the altering tracking conditions in the stereo microgroove during the run of the groove towards the dead wax (lead-out non-engraved groove) just wouldnʼt leave me alone. I wanted a tangential curve that – within the geometrical possibilities of the circle segment trying to approach a straight line with two intersections (null points) – better addressed the real-world conditions and thus would allow for improved sonic performance as a result of better mechanical routed decoding of the engraved signal. It took a couple of weeks with many long evenings to arrive at the tangential curve that I named UNI-DIN. UNI of course refers to universal, and DIN (German Industrial Standard/ Deutsche Industrie Norm) refers to the older (German) standard of a 57.5 mm inner radius limit engraved groove. The later, however, only as a general hint in a certain direction. UNI-DIN was developed to best accommodate the real-world conditions of the modern 12-inch stereo microgroove record. It is very important to keep this in mind. I did not design and calculate the UNI-DIN tangential curve to be used for all records past and present, not for 78s, not for 7-inch and not for mono records. It is tailored for 12-inch stereo microgroove records only. In todayʼs modern world, there is no free lunch. Well, there actually hasnʼt been any since civilization began. Baerwaldʼs and Loefgrenʼs calculations for a best possible combination of lowest average as well as lowest maximum derivation for a circle segment trying to approach a straight line with two null points canʼt be bettered in our geometry and within the premises they took 75+ years ago. What can be bettered, however, is the resulting tracking distortion in a modern stereo microgroove. A medium which was not in sight when Loefgren and Baerwald did their calculations. They created LoefgrenA / Baerwald fort he mono 78 records of the day. We can get sonically better playback with a tangential curve that is not viewed under plain generalized linear geometric aspects, but rather under weighted criteria of the real – non-linear – medium. In UNI-DIN the areas of higher and lower derivation are positioned differently from Baerwald and Loefgren. With UNI-DIN, slightly higher derivation at the beginning of the groove – where the overall “working” conditions for the stylus are best! – is traded for lower derivation towards the inner groove – where the tracking conditions are worst. But thatʼs not all. UNI-DIN further pays close attention to something the other tangential curves (if we add Stevenson and Loefgren B) paid no attention to at all: the human brain and our way of hearing. The human ear (actually the part of our brain that composes what we mean by hearing) is very sensitive to changes. UNI-DINʼs curve is actually flatter than the other curves, in the sense that the inevitable dips and peaks of derivation in the tangential curve are smoother – less steep/fast in both directions. This results in less notable alternations – less notable for our brain – in tracking distortion. Further, UNI-DIN features an unusual offset angle and overhang for the effective length. This results in less resulting skating force (I will cover this very specific topic in a later essay) with any cartridge and pivoted tonearm. If in doubt, please check it out with your set-up – you will see that this statement is correct. UNI-DIN offers more headroom in critical passages. Towards the inner grooves especially there is much cleaner sound with more stable soundstage. Sibilants in female voices are much easier to handle and feature notably fewer tendencies to break up or become harsh and unnatural. Soundstage dimensions and depth are increased and more stable over the entire record. The sound, in general, is more relaxed and seems to have more headroom – the more the record is cut towards the label, the more apparent to the ear. As said before, UNI-DIN does NOT follow the standard calculations for tangential curves as we know them. It also features a very unusual resulting offset angle and overhang for the effective length. UNI-DIN was first designed – then calculated. It is a planned tangential curve – I sketched and drew the resulting curve first and then calculated it. One may be tempted to recalculate UNI-DIN based on the known second null point with the calculation tools offered in VinylEngine or similar websites. This, however, inevitably results in a first Null point more than 20 mm away from reality. And thus this leads to a graphic curve that is anything but the curve describing UNI-DIN. Get info and specials directly from Galen Carol. © 2019 Galen Carol Audio. All Rights Reserved.